In 1984, The Phuket Marine Biological Center (PMBC) surveyed crown-of-thorns starfish outbreaks in the reefs on islands in the Andaman Sea. Serious outbreaks were found on Adang and Rok Islands. Surin and Racha Islands did not show outbreaks, however, there was a presence of dead coral which was suspected to have been caused by crown-of-thorns starfish. 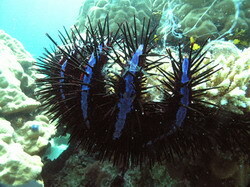 In the Similian Islands there was less crown-of-thorns evidence than in other places; however, a serious outbreak was found later in 1995 at Payan Island, a member of the Similian group. The PMBC staff collected more than 300 crown-of-thorns starfish from that one island. At the present time, outbreaks are still found in some areas. 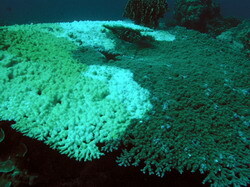 In early 2007, an outbreak was found in a small cove, south of Ba-ngu Island (the northernmost island of the Similian group). The reef had been hugely degraded within a few months as a result. At Racha Yai Island, outbreaks were found at some spots on the east coast of the island. Many divers have asked how many crown-of-thorns starfish in a certain area define it as an outbreak. Scientists approximate the following: if there are greater than 10 individuals in one hectare, that area is considered to have an outbreak. If there are greater than 30 individuals in one hectare, the outbreak is at a very serious level. 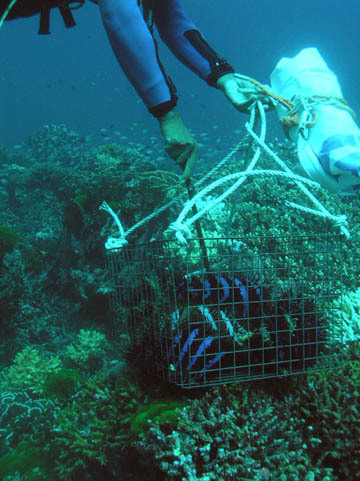 If divers find an outbreak case, it is acceptable to kill or remove the starfish to help preserve the affected reefs. However, if the outbreak area is within a National Park, a permit must be obtained before anything can be removed. There are several methods which can be used to limit the number of crown-of-thorns starfish. You can use a knife to cut the central part of the starfish body, but should take care not to merely cut it in half, as the two halves can regenerate. Another option is to collect the starfish and bring them on shore to dry out. You may also call the PMBC to report an outbreak at a particular site, and attempts will be made to alleviate the situation. Table Coral (Acropora clathrata): the left portion of the colony has been eaten, the right portion is still alive. 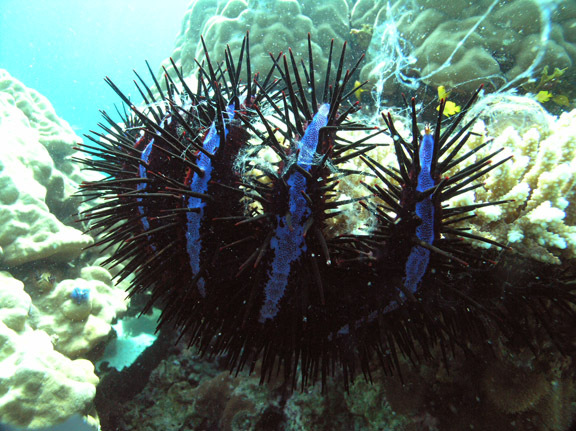 The crown-of-thorns starfish is a natural part of the reef ecosystem, and if the population levels are balanced, it is beneficial to the environment. These starfish choose to eat fast growing coral species, particularly staghorn coral. 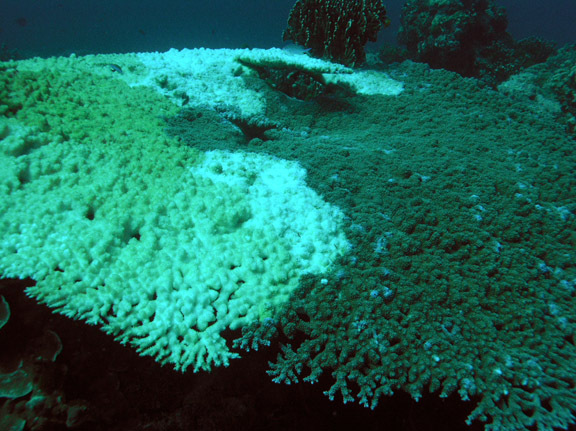 Fast growing coral species can cover areas very quickly, and compete for space with slow growing species. The crown-of-thorns starfish helps to maintain a balance, and allows space for the slowing growing species, therefore creating higher levels of diversity. Currently, high levels of fertilizer are used in agriculture, and are subsequently being flushed to the sea. This fertilizer provides food for phytoplankton, and when phytoplankton blooms it causes zooplankton to bloom as well. The larvae of the crown-of-thorns starfish begins as zooplankton, so the presence of fertilizer causes the crown-of-thorns starfish to proliferate. Another cause of the abundance of these starfish is a lack of predators such as the Triton, triggerfish, due to hunting. All lives in the sea are linked in a complex food web. If the numbers of all species are kept in balance, the ecosystem is sustained. However, if certain species become dominant and the numbers are too high, the ecosystem is degraded and becomes unstable.